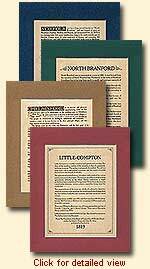 Typeset on parchment, matted in acid-free mats ($10), or unmatted ($7). See item details for mat color choices. 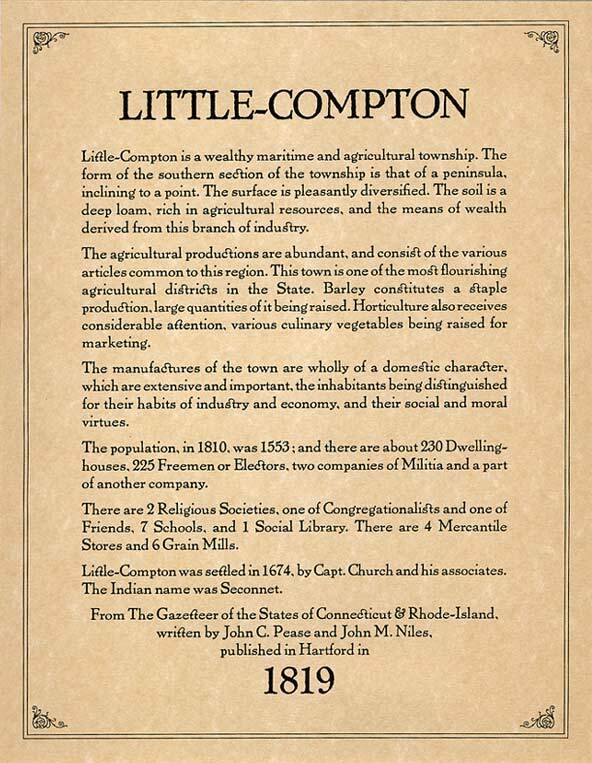 Town Descriptions are excerpted from state gazetteers written in the 1800s. A town description might typically include a description of the land in a town, bodies of water and rivers (ex. The waters of Bristol are unrivalled for their beauty or the navigable advantages which they afford), villages, types of agriculture and industry (ex. Mount Holly has two grist-mills, 12 saw-mills, one tannery, four mills for cutting out chair stuff, two butter-tub factories, and one rake factory. ), number of inhabitants, schools, dwelling houses. The origin of the town name and names of early settlers are often mentioned. Different authors have different styles, and where there was more material about a town than would fit in our format, we have tried to choose the information of most interest today. The author of the Massachusetts town descriptions, The Rev. Elias Nason, was one of the most enthusiastic writers eve to put pen to paper. His descriptions of Massachusetts towns are great fun to read. 358 Items. Showing Items 1 thru 50. KHB1 1882 Town Description (NOT A MAP) of South Boston, Massachusetts (MA). An excerpt from King's Handbook of Boston Harbor, published in 1882. KHB2 1882 Town Description (NOT A MAP) of East Boston, Massachusetts (MA). An excerpt from KingÕs Handbook of Boston Harbor, published in 1882. KHB3 1882 Town Description (NOT A MAP) of Dorchester, Massachusetts (MA). MTD001 1877 Town Description (NOT A MAP) of Abington, Massachusetts (MA). An excerpt from the Gazetteer of Massachusetts (MA) by the Rev. Elias Nason, describing the town as it was then. MTD002 1877 Town Description (NOT A MAP) of Acton, Massachusetts (MA). MTD003 1877 Town Description (NOT A MAP) of Acushnet., Massachusetts (MA). MTD004 1877 Town Description (NOT A MAP) of Adams, Massachusetts (MA). An excerpt from the Gazetteer of Massachusetts (MA) by the Rev. Elias Nason, describing the town as it was then. This town description makes an excellent companion piece to the Adams town map. MTD005 1877 Town Description (NOT A MAP) of Agawam, Massachusetts (MA). MTD006 1877 Town Description (NOT A MAP) of Alford, Massachusetts (MA). An excerpt from the Gazetteer of Massachusetts (MA) by the Rev. Elias Nason, describing the town as it was then. This town description makes an excellent companion piece to the Alford town map. MTD007 1877 Town Description (NOT A MAP) of Amesbury, Massachusetts (MA)..
MTD008 1877 Town Description (NOT A MAP) of Amherst, Massachusetts (MA). MTD009 1877 Town Description (NOT A MAP) of Andover, Massachusetts (MA). MTD010 1877 Town Description (NOT A MAP) of Arlington, Massachusetts (MA). MTD011 1877 Town Description (NOT A MAP) of Ashburnham, Massachusetts (MA). An excerpt from the Gazetteer of Massachusetts (MA) by the Rev. Elias Nason, describing the town as it was then. This town description makes an attractive set with the Ashburnham map of 1870. MTD012 1877 Town Description (NOT A MAP) of Ashby, Massachusetts (MA). MTD013 1877 Town Description (NOT A MAP) of Ashfield, Massachusetts (MA). MTD014 1877 Town Description (NOT A MAP) of Ashland, Massachusetts (MA). MTD015 1877 Town Description (NOT A MAP) of Athol, Massachusetts (MA). An excerpt from the Gazetteer of Massachusetts (MA) by the Rev. Elias Nason, describing the town as it was then. This town description of Athol makes a nice companion piece to the Athol map of 1870. MTD016 1877 Town Description (NOT A MAP) of Attleborough, Massachusetts (MA). MTD017 1877 Town Description (NOT A MAP) of Auburn, Massachusetts (MA). An excerpt from the Gazetteer of Massachusetts (MA) by the Rev. Elias Nason, describing the town as it was then. This Auburn town description makes an attractive companion piece to the Auburn map of 1870. MTD018 1877 Town Description (NOT A MAP) of Ayer, Massachusetts (MA). MTD019 1877 Town Description (NOT A MAP) of Barnstable, Massachusetts (MA). MTD020 1877 Town Description (NOT A MAP) of Barre, Massachusetts (MA). An excerpt from the Gazetteer of Massachusetts (MA) by the Rev. Elias Nason, describing the town as it was then. This town description of Barre makes an attractive companion piece to the Barre map. MTD021 1877 Town Description (NOT A MAP) of Becket, Massachusetts (MA). An excerpt from the Gazetteer of Massachusetts (MA) by the Rev. Elias Nason, describing the town as it was then. This town description makes an excellent companion piece to the Becket town map. MTD022 1877 Town Description (NOT A MAP) of Bedford, Massachusetts (MA). MTD023 1877 Town Description (NOT A MAP) of Belchertown, Massachusetts (MA). MTD024 1877 Town Description (NOT A MAP) of Bellingham, Massachusetts (MA). MTD025 1877 Town Description (NOT A MAP) of Belmont, Massachusetts (MA). MTD026 1877 Town Description (NOT A MAP) of Berkley, Massachusetts (MA). MTD027 1877 Town Description (NOT A MAP) of Berlin, Massachusetts (MA). An excerpt from the Gazetteer of Massachusetts (MA) by the Rev. Elias Nason, describing the town as it was then. The Berlin town description makes an attractive companion piece to the 1870 Berlin map. MTD028 1877 Town Description (NOT A MAP) of Bernardston, Massachusetts (MA). MTD029 1877 Town Description (NOT A MAP) of Beverly, Massachusetts (MA). MTD030 1877 Town Description (NOT A MAP) of Billerica, Massachusetts (MA). MTD031 1877 Town Description (NOT A MAP) of Blackstone, Massachusetts (MA). An excerpt from the Gazetteer of Massachusetts (MA) by the Rev. Elias Nason, describing the town as it was then. This Blackstone town description makes an attractive set with the 1870 Blackstone map. MTD032 1877 Town Description (NOT A MAP) of Blandford, Massachusetts (MA). MTD033 1877 Town Description (NOT A MAP) of Bolton, Massachusetts (MA). An excerpt from the Gazetteer of Massachusetts (MA) by the Rev. Elias Nason, describing the town as it was then. This Bolton town description makes an attractive companion piece to the 1870 Bolton map. MTD034 1877 Town Description (NOT A MAP) of Boston, Massachusetts (MA). MTD035 1877 Town Description (NOT A MAP) of Boston Corner, Massachusetts (MA). MTD036 1877 Town Description (NOT A MAP) of Boxborough, Massachusetts (MA). MTD037 1877 Town Description (NOT A MAP) of Boxford, Massachusetts (MA). MTD038 1877 Town Description (NOT A MAP) of Boylston, Massachusetts (MA). MTD039 1877 Town Description (NOT A MAP) of Bradford, Massachusetts (MA). MTD040 1877 Town Description (NOT A MAP) of Braintree, Massachusetts (MA). MTD041 1877 Town Description (NOT A MAP) of Brewster, Massachusetts (MA). MTD042 1877 Town Description (NOT A MAP) of Bridgewater, Massachusetts (MA). MTD043 1877 Town Description (NOT A MAP) of Brighton, Massachusetts (MA). MTD044 1877 Town Description (NOT A MAP) of Brimfield, Massachusetts (MA). MTD045 1877 Town Description (NOT A MAP) of Brookfield, Massachusetts (MA). MTD046 1877 Town Description (NOT A MAP) of Brookline, Massachusetts (MA). MTD047 1877 Town Description (NOT A MAP) of Buckland, Massachusetts (MA).